Apparently, the prime minister is considering ways to ease the burden of student debt (story here). That sounds like a good idea; she might also take the opportunity to consider how the tuition fee and loan system has changed the university system in this country and whether there’s a case for more fundamental change. The popularity of Labour’s promise to abolish university tuition fees has clearly rattled the Conservatives. But it would be wrong to think of this as a simple political bribe which can be cancelled out by a counter-bribe. Such spending promises are the bread and butter of electoral politics, but the promise of free education, as part of a National Education Service, is more than just a spending commitment. 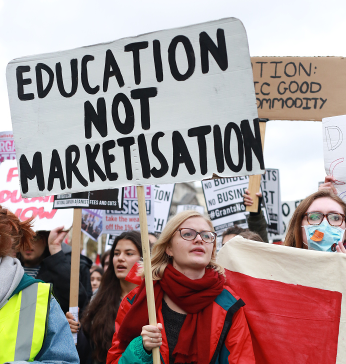 It is a rejection of marketisation which many people feel has gone too far, with real consequences for quality and equality – in education and in other public services. If that is the case, simply tweaking the interest rates on student loans won’t cut it. The prime minister is also said to be considering a plan to name and shame universities that fail to improve students’ earning potential. In other words, consumers just need better data about exactly how much their degree will improve their earning power and somehow the system will improve. This is one of those ‘pure’ market prescriptions which sees a public good as a purely financial good whose benefits to the individual can be quantified in value for money terms with no recognition of the wider social benefits or the macroeconomic and labour-market factors which impact on graduate earnings. Such a move would be absolutely in line with the wider marketisation project. This has several elements, each of which can be specifically promoted by government policy while also taking root in the assumptions and behaviours of organisations and the people within them. In higher and further education, there’s no doubt that marketisation has changed the way people think and behave. Redefining education providers as businesses in competition with each other. Redefining students as consumers in competition with each other for the most valuable resources. Redefining educational achievement in financial terms. Financialization (giving a monetary value to things) and marketisation (creating a market where things are exchanged for money) go hand in hand to drive the process at all levels, from the national to the institutional to the personal. In education, this threatens to reduce everything to essentially financial transactions; from our national priorities to the process of teaching and learning and the teacher-student relationship. At the national level it’s all about the success of UK plc and at the individual level it’s all about getting a better paid job. All social, political and cultural objectives are relegated to second order aims or ‘good intentions’. This radical reductivism of the social to the financial fails to address the needs of a modern, democratic society trying to tackle any of the global and local challenges which we face. Reducing education, health, the environment, the economy, housing, human relations etc. to the purely economic is a recipe for disaster and economic failure. By forcing us to ignore the complexity of our societies and economies it prevents us from developing the complex policy responses which might actually take us forward. If the prime minister wants to address concerns about higher education, perhaps she should be asking more fundamental questions about what we want from education in general and university degrees in particular. This entry was posted in Education, Education policy, Politics and tagged Education, Labour party, marketisation, politics, student debt, student loans, Universities, university fees. Bookmark the permalink.